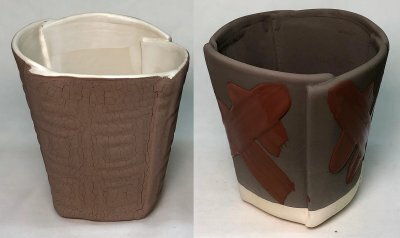 In ceramics and pottery dipping glazes can be of two main types: For single layer or as a base for the application of other layers overtop. Dipping is the preferred method of application for single layer inside functional surfaces. Drying is quick and coverage is even if the slurry has the right thixotropic behaviour. Where large outside areas need to be covered with one glaze this method is even better. Glazes that can be gelled to be thixotropic and dry quickly must be free of binders and gums, they suspend and harden solely because of clay in the recipe. This type of glaze is easy to make, recipes and the materials they call for are common. When other layers of glaze are to be dipped or brushed over a dipping glaze (and no firings are done between layers), then that dipping glaze needs to contain a binder (usually gum) to fix it well to the body and harden it on drying. 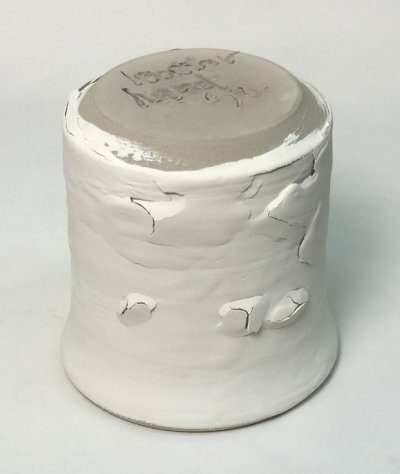 Binders are effective only if the glaze has plenty of super-fine particles for them to bind with (thus bentonite additions are common in gummed dipping glazes). These glazes dry slower, go on thinner and drip a lot during draining. On this website most of the articles and reference material assume the making of single layer type glazes not having gum (unless otherwise mentioned). 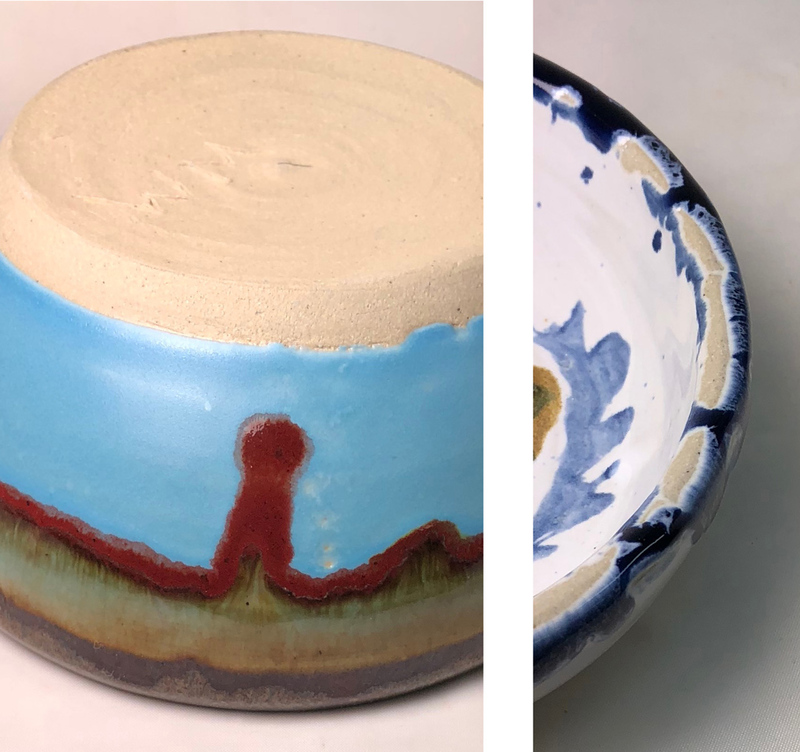 We are dedicated to the understanding of relationships between a glazes material recipe and oxide chemistry with how it behaves in use, how it fires in a kiln and how it interplays with the body it is on. People most interested in this topic are making this type of glaze. Weekend warrior type potters are more interested in buying commercial bottled and gummed products and exploring all the colors and interactions of multilayering with them. Non-gummed dipping glazes go on evenly and dry quickly on bisque ware (if properly gelled). But they only work well as a single layer. If you try to paint commercial gummed brushing glazes over them the latter will compromise their bond with the body, cracks will develop during drying and bare patches like this will result during firing. For multi-layering the base dipping glaze must be gummed (e.g. 1% CMC gum). It will go on thinner, drip longer and dry much slower, but that is the price to pay if you want to layer over it. 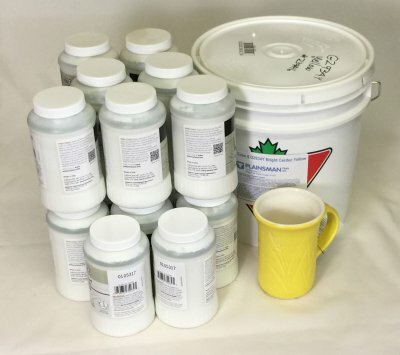 The glaze on the left is 85% of a calcine:raw Alberta Slip mix (40:60). It was on too thick so it cracked on drying (even if not too thick, if others are layered over everything will flake off). The solution? The centre piece has the same recipe but uses 85% pure raw Alberta Slip, yet it sports no cracks. How is this possible? 1% added CMC Gum (via a gum solution)! This is magic, but there is more. It is double-layered! Plus very thick strokes of a commercial brushing glaze have been applied. No cracks. CMC is the secret of dipping-glazes for multi-layering. The down side: More patience during dipping, they drip a lot and take much longer to dry. I have a jar of testing clear glaze that I mixed myself (10% yellow stain and 2% zircopax added to cone 03 G2931K clear). 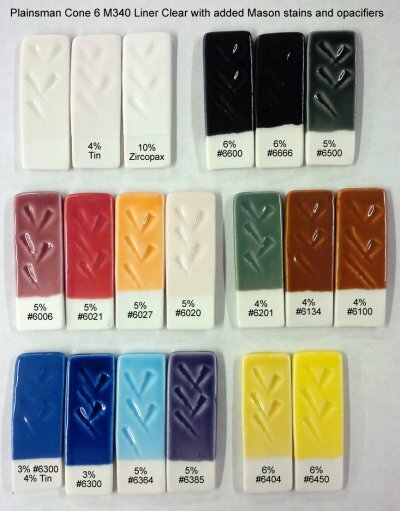 Commercial glaze producers make their lines of glazes like this. The cost of the dry materials: About $6. How can I make it paintable? I made a spreadsheet where I can specify the weight of the plastic jar, the percentage of CMC gum powder needed and the concentration of the gum solution. I just need to weigh the jar of glaze (without lid), weigh a teaspoon of the liquid glaze (lower left), dry it (upper right) and weigh the dry (lower right). After filling in these numbers the sheet tells me what weight to evaporate the jar to and how much gum solution to mix in. It paints on just like a commercial glaze. But don't do this. I made another spreadsheet online (link below) based on starting from dry ingredients, adding the correct amount of water and gum solution. Of course, you need a good mixer to do this. Can you brush a dipping glaze on to leather hard ware? No. The body needs to shrink as it dries. 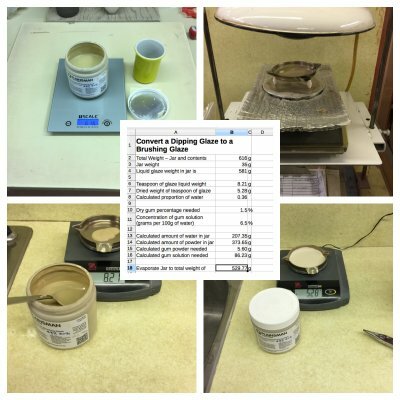 Typical glazes have low clay content and shrink very little. So as the body shrinks underneath the glaze just flakes off. Brushing glazes contain significant amounts of gum, that gum bonds them securely to bisque ware, but not to unfired ware. As you can see here. the glaze bond with the body could not withstand the differential during drying. 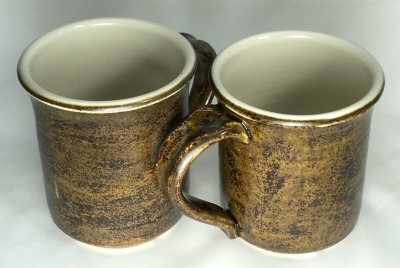 Left: Ravenscrag G2928C matte on inside of mug. Right: A clear glossy. The matte needs to be soaked in the kiln long enough to make sure it develops a functional surface, especially on the bottom. Mattes are not always the best choice for food surfaces, but you can do it if you blend in enough glossy glaze to make it smooth enough not to cutlery mark. 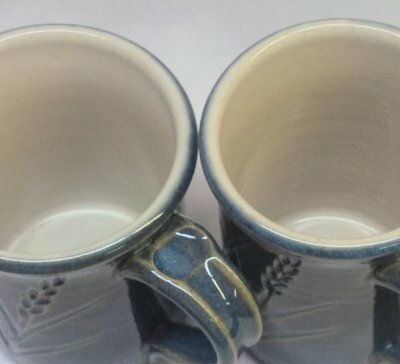 These cone 6 porcelain mugs are hybrid. Three coats of a commercial glaze painted on outside (Amaco PC-30) and my own liner glaze poured in and out on the inside (G2926B). When commercial glazes (made by one company) fit a stoneware or porcelain (made by another company), without crazing or shivering, it is purely an accident! So use them on the outside. But for inside food surfaces make or mix your own. When you know the recipe you can tune the thermal expansion. And the degree of melt. And the application properties. And you can use quality materials to source a balanced chemistry. The place to start understanding your glazes, organize testing and development and document everything is an account at Insight-live.com. Think the idea of mixing your own glazes is dead? Nope! These are two pallets (of three) that went on a semi-trailer load to a Plainsman Clays store in Edmonton this week. They are packed with hundreds of bags of powders used to mix glazes. 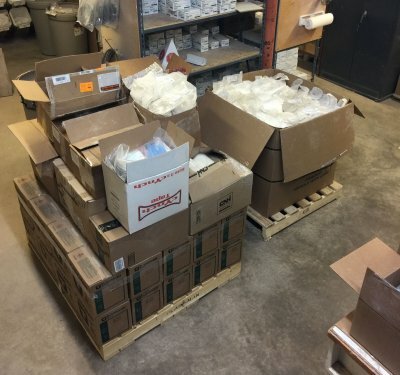 More and more orders for raw ceramic materials are coming in all the time. 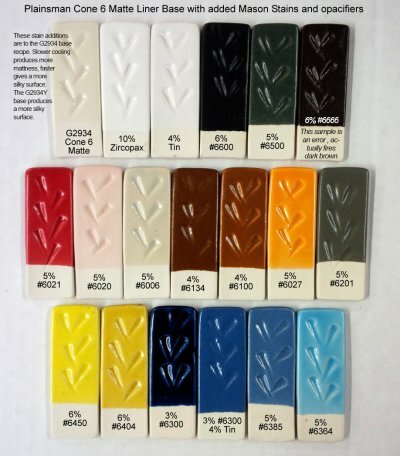 Maybe you are using lots of bottled glazes but for your cover and liner glazes it is better to mix your own. And cheaper! And there are lots of recipes and premixed powders here to do it. One of the big advantages is that when you dip ware into a properly mixed slurry it goes on perfectly even, does not run and dries on the bisque in seconds. No bottled glaze can do that.